Ukraine has reached an in principal agreement with some of its bondholders to reduce the amount of debt owed by 20%, and suspend payments for four years. The deal will be voted on in mid-September. Even if a large majority agree to the deal, some bondholders may choose not to take part, and will be able to demand to be paid in full through courts in London. Ukraine had been seeking a 40% reduction. 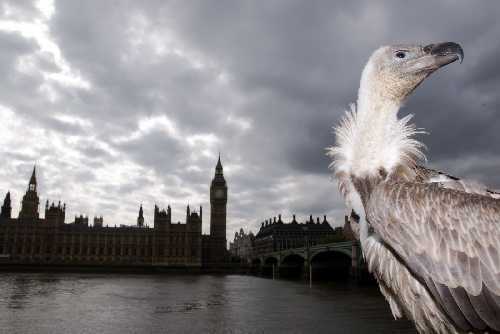 A vulture outside the UK parliament in 2009. The Ukrainian bonds are owed under English law. When a similar debt restructuring was undertaken of Greece’s bonds in 2012, 29% of holders of bonds under English law refused to take part in the agreement. Because the UK government refused to act to enforce the agreed debt restructuring, the Greek government paid them in full. One owner of a $3 billion Ukrainian bond is the government of Russia, which has already said it will refuse to take part in the deal. This could lead to the Russian government suing Ukraine in London courts, unless the UK government takes action. In 2010, the UK government passed the Debt Relief (Developing Countries) Act. This enforced the debt restructurings agreed under the Heavily Indebted Poor Countries initiative on any claimants against those 40 countries in UK courts. In September 2014, the UN General Assembly voted by 124 votes to 11 to create an international legal framework for resolving sovereign debts. However, the UK, Germany and US were among the 11 countries which voted against.